710 = 2 x 5 x 71. 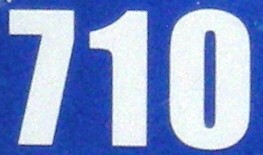 710 is a divisor of 917 - 1. 710 is 222022 in base 3. It is 868 in base 9. The sum of the divisors of 710 is a square: 1 + 2 + 5 + 10 + 71 + 142 + 355 + 710 = 1296 = 362. 710 is the sum of nine positive fifth powers: 710 = 35 + 35 + 25 + 25 + 25 + 25 + 25 + 25 + 25. 710 is the number of connected graphs with 9 edges. Source: What's Special About This Number?